J-J. Levy， "Un Petit Bogue, Un Grand Boum!" (in French)， 2010. J-L. Lions et al.， "Ariane 501 Inquiry Board Report," 1996. E. Evans, Domain Driven Design, Addison- Wesley， 2004. F. Buschmann and K. Henney， "Five Considerations for Software Architecture, Part 1, IEEE Software, vol. 27, no. 3, 2010, pp. 63-65. E. Woods, "Architecting in the Gaps," 2011. 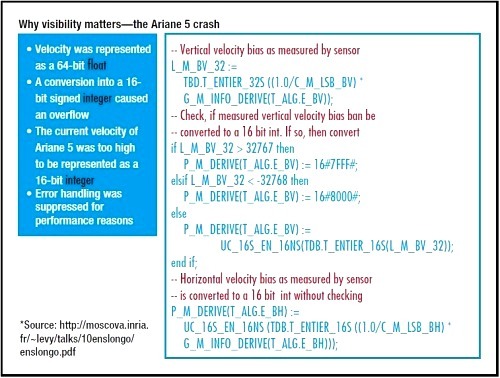 F. Buschmann, "Unusable Software Is Useless, Part 1," IEEE Software, vol. 28, no. 1, 2011, pp. 92-94. F. Buschmann, K. Henney， and D.C. Schmidt, Pattern-Oriented Software Architecture-A Pattern Language for Distributed Computing, John Wiley and Sons, 2007. G. Hohpe and B. Woolf, Enterprise Integration Patterns-Designing, Building, and Deploying Messaging Solutions, Addison-Wesley， 2003. F. Buschmann, "Learning from Failure, Part 2: Featuritis, Performitis, and Other Diseases," IEEE Software, vol. 27, no. 1, 2010, pp. 10-11. K. Henney， "Use Uncertainty as a Driver," 97 Things Every Software Architect Should Know， R. Monson-Haefel, ed.， O’Reilly， 2009, pp. 321-361.